CRICKET. Rizwan Cheema is fast becoming a disturbing sight for opposition bowlers at the ICC World Cricket League Division III in Kampala. The man whose imperious batting made the difference between Canada and hosts Uganda confirmed his status as the destroyer of economies when he stepped up and launched Ali Khawar’s delivery into the tennis courts. The calm batsman was easing into his boundaries loading three sixes and four boundaries as he quickly picked up Canada’s run rate in a 30 run sixth wicket stand with Navneet Dhaliwal 31(51) and 23 for the seventh with Nikhil Dutta 41(34). Oman had won the toss and elected to field at Lugogo Cricket Oval a decision that Canada exploited with Nitish Kumar 33(37) and Bhavindu Adhihetty 44(75) putting on 77 for the first wicket, looking comfortable in strike rotation and finding boundaries against the opening pair of bowlers. 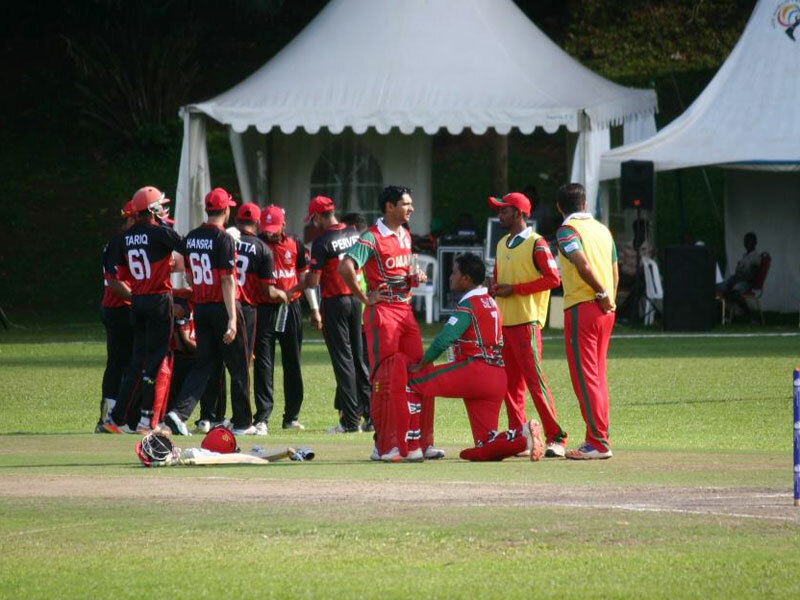 The introduction of Ali Amir broke the stand as wicket keeper and captain Sultan Ahmed pulled off a neat stumping off a wide ball down the leg side; Khawar then continued the good work picking off the Canadian middle order taking the wickets of Dhanuka Pathirana 24(22), who was beginning to look dangerous, and Jimmy Hansra. Dutta found the boundary five times with two sixes and his 72 for the eighth wicket with Hamza Tariq 34(22) pushed Canada past 250 the innings ending on 274. Oman had the worst start possible to a run chase of their magnitude when big hitter Khawar Ali was run out by Adhihetty, Cecil Pervez and Dhindsa quickly adding to the damage by picking Pouluse and Ilyas who had scored a half ton against USA in the previous day’s win. Zeshaan Maqsood 63(62) looked his usual technical best surviving the swing and accuracy of Pervez before he loosened up to pick the short ones early and begin peppering the deep mid wicket and deep square leg boundaries. Maqsood and Ajay Lalcheta 39(43) then set about repairing the damage in a 50 run fifth wicket partnership that saw Lalcheta and Maqsood up the run rate with minimal risk and executing their big scoring shots against errors in line and length from the Canadian bowlers. Dindsa returned to the attack to pick Maqsood caught behind and Oman never recovered. A late order flurry from Captain Ahmed Sultan 30(60) was too little too late as Dindsa cleaned up the tail ender to hand Canada their second victory of the world Cricket League Division 3 and remain top of the standings.